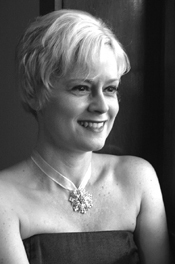 Donna Cain has had solo and ensemble experience in operas, operettas, musical theatre, early music and oratorio. In Australia, she has been a member of Pacific Opera, Rockdale Opera, North Sydney Opera, Chatswood Musical Society and the Waverley Lugar Brae Players, and in The Netherlands Donna sang in concerts, and for churches and choirs including Brabant Koor and Alexander Kammerkoor (chamber choir). With a vocal range of over three octaves, Donna is specializing in the coloratura soprano operatic repertoire and the higher soubrette roles. Music Festival on April 4th & 5th . Other upcoming events include a corporate function for charity on September 30th, for which Donna will be the soloist, accompanied by piano. During the past two years, Donna has furthered her singing studies in The Netherlands, but since late September, 2004, Donna has relocated back to her home city of Sydney. (in two separate stints - for 3 months, then another 6 months) in the UK. Other teachers include Andrew Dalton at the Sydney Conservatorium of Music. Over the last two years, Donna studied singing with Prof. Prizrenka McCray (wife of American Wagnerian tenor James McCray), in Den Haag, The Netherlands, and during this time, Donna also received vocal coaching from Peter Nilsson in Den Haag. Previous vocal coaches include Victor Morris (UK) and Stephen Meli (Australia). Donna studied piano to fourth grade, and Donna teaches private singing lessons, focusing on vocal technique. DEGREES: Bachelor of Arts Degree (Visual Arts) from the Sydney College of Advanced Education (City Art Institute). Donna is currently studying (via distance education) for the Bachelor of Music/Bachelor of Teaching degree at the University of New England, Armidale. Donna has performed opera roles including Frasquita in Carmen, and Siebel in Faust. In operetta, Donna played the lead role of Mabel in The Pirates of Penzance by Gilbert and Sullivan, and in musicals, Donna was the principal character Marsinah in Kismet. Donna has appeared on community TV, and has sung professionally as a soloist at cultural festivals, fundraising events, weddings and corporate functions. Donna worked for Singing Telegrams, as a Marilyn Monroe and Kylie Minogue impersonator. With mezzo-soprano Nicole Smeulders, Donna founded the professional singing duo Belle Voci in Sydney. Donna and Nicole, in Belle Voci, performed regularly at weddings, festivals and other occasions. In 2001, Donna performed as a chorister and was understudy to the soprano soloist in the Grand Russian Chamber Choir at the Australian Opera House, for the opening of Roger Woodwards International Festival of New Music. The choir performed a series of unaccompanied pieces by Shostakovich. Donna sang as an operatic soloist at the Italian-Australian Lanterna Committees dinner dance that was attended by the NSW State Minister for Tourism in 1999. Awards include 3rd prize in the Grand Final of the Parramatta Aria competition, 2001.
performing a number of operatic solos and duets. Search for a Star contest in Deal, UK. audience of 400 at Noordekerk, sGravezande, in The Netherlands. In 2003, Donna performed in Het Concertgebouw, Amsterdams prestigious concert hall, in Brabant Koors performance of Holsts The Planets, conducted by Englishman Richard Hickox. Donna again performed with Brabant Koor for the production of Rihms Deus Passus, conducted by Markus Stenz at De Doelen concert hall, Rotterdam. in this event held at De Rode Hoed theatre in Amsterdam.